It’s easy to forget sometimes that even the apostles were men like us. They had their quarrels and issues with each other just as we sometimes do. In Galatians 2 Paul is talking about how he was accepted amount his Jewish brothers in the apostleship even after once being called Saul and having made a good living hunting them down and killing them. Though they were all circumcised Jews, which was perceived to make them holy under the old Leviticus laws, and Paul was a Gentile, they had seen the grace of God acting in his life, and accepted him with the right hand of fellowship (Galatians 2:9). But then there was that “thing” with Peter. I can just see it unfolding. They’re getting ready to sit down to dinner, and here come some of the Jewish buddies of Peter’s. Under the old Jewish law, a Jew did not eat with a Gentile (a non-Jew). Peter starts to feel uncomfortable. He’s wondering “what will my Jewish friend think? Will they judge me to not be holy?” He squirms. He walks around nervously, ignoring the buffet line. Then he gets his plate. But instead of sitting in his normal seat at the table with Paul and the other Gentile believers, Peter withdraws to a corner away from them. And the next thing you know, all his Jewish friends are standing in a corner with him too, refusing to eat with their Gentile brothers. Peter had a hypocritical tendency when his Jewish friends came around. When they weren’t there, he was happy to eat with the uncircumcised Gentile believers. But when his Jewish buddies came around, he would withdraw. This had to do with the old laws that he’d been raised to obey under his Jewish faith and traditions. The problem was that now that God’s grace had come by belief in Jesus, the old laws were null and void. Belief in Jesus makes you holy – not following and working in the laws (Ephesians 2:8-9). But Peter couldn’t let go of it. He felt compelled to do what he’d always done. He’d strapped back on the ball and chain of the law and stopped walking in grace. He’s stopped thinking about what God wanted, and started wondering what his peers thought. No sin is personal. No matter how small it may seem, there’s always someone watching your moves and following you. When the other Jewish apostles saw Peter withdraw, they did the same. Now there sits Paul and all the Gentiles that were so accustomed to having Peter be one of them, and Peter has turned his hypocritical back to them. That must have felt like a slap in the face! It was one of those yesterday-you-were-my-friend-but-today-I’m-not-good-enough moments. So what should we do when we encounter hypocrisy or disagreements amount our brothers and sisters in Christ? Exactly what Paul did! He called him out! Paul stood up to him and called him a hypocrite and corrected him. He did it in love, but he did it all the same. This corrective discussion is where we get the often quoted Galatians 2:21 where Paul tells Peter, “I do not set aside the grace of God; for if righteousness comes through the law, then Christ died in vain.” If you use God’s word to correct, no one gets hurt. That’s your duty among your brothers and sisters – to rebuke one another. It wasn’t only for Paul’s hurt feelings that he corrected Peter, it was for Peter to grow and learn and be stronger in his faith. It would have been easy enough for Paul to have said to his Gentile friends when they saw they were being ostracized “Just relax, his Jewish friends will be gone home soon, and Peter will be himself again.” But that would that have only smoothed over the hurt feelings. The only way to right a wrong between friends is remove it. You can’t brush over it. It’s like a splinter in the skin. You may just get the visible part out of the way, but until it’s truly gone, it’s going to hurt. 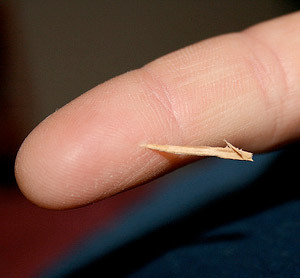 Don’t be a splinter. And if you have one – get it out!